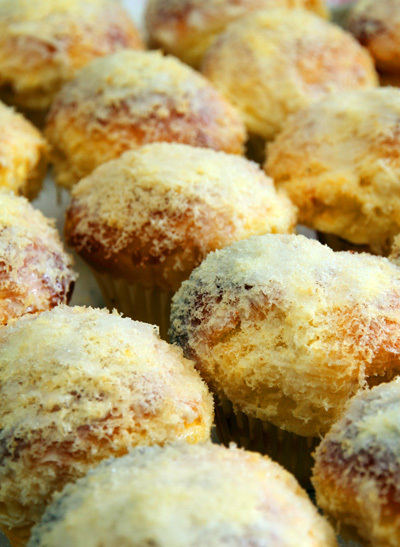 Bistro Filipino home bakery strives every day to make the best Philippine breads and pastries. All of our products are made with the finest ingredients and are individually hand crafted using time honored techniques to ensure the highest quality. Brothers Paolo and Nico Borromeo started Bistro Filipino bakery in their home kitchen making pastries that brought back fond memories of their homeland. Not satisfied with just knowing the recipes, they searched for long forgotten techniques and developed some of their own to create breads, desserts and pastries that were enjoyed by friends and family. We invite you to try our specialties like Ensaymada, a soft buttery sweet cheese brioche, Food for the Gods, a chewy date and walnut square and holiday Sans Rival a light, crispy, butter cream filled medallion, made only during the Christmas time. We only make a few products but strive to make them the best. Place an order, pickup from our home and come meet us. We have an uncompromising dedication to quality. From ingredients to processes, we continually strive to make things better. Quality is a priority that we cannot compromise. It is a standard, not an option. Bistro Filipino Bakery is committed to bringing a taste of the Philippines to everyone. Through our products we hope to share the rich and delicious essence of Philippine cuisine and culture. Discover and experience something new, or reconnect with your roots. Behind what we do is a simple desire to make people happy. We hope that a taste of our products evokes fond memories and creates new ones. We wish to be a part of your lives, be it in celebrations, as a gift to friends, or in simply sharing life's tasty pleasures with your loved ones.